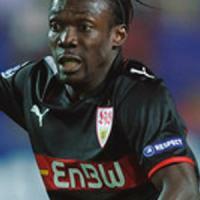 Arthur Boka is a Ivorian football defender who plays for VfB Stuttgart. Like many successful players from Côte d'Ivoire, he started his career at homeland club ASEC Abidjan, after coming through their much famed youth system, that has also produced players such as Kolo Touré, Emmanuel Eboué, and Aruna Dindane. He joined the club after walking in from the streets of Côte d'Ivoire capital Abidjan and asking for a trial. Following his graduation from the academy he moved on to Belgian club K.S.K. Beveren in 2002, where impressive performances earned him a transfer to the then Ligue 1 club RC Strasbourg in France for the 2004–05 season. He impressed further at Strasbourg, but following their relegation at the end of the 2005–06 season he left to join German top-flight club VfB Stuttgart. His impressive attack minded play from his left-back position have earned him the nickname of "The African Roberto Carlos". On 14 January 2009 he extended his contract at VfB Stuttgart until the summer of 2012. He has 54 caps for the national team, and was called up to the 2006 World Cup, where he played all three group games for the Elephants, where he performed impressively, gaining one assist. Boka is known for his lightning pace even though he is a man of a very small build. He represented Côte d'Ivoire in the 2006 Africa Cup of Nations and was also part of the Ivorian squad at the 2008 Africa Cup of Nations in Ghana.